We were writing things about countries and we were writing how they celebrate christmas. We were writing one name of a country and we were writing what food what greetings and other things. We were doing lights of history and we were talking about things that we were ask we were learning about christmas. We were doing christmas things we were doing one and we were learning about christmas.we were lerning about Christmas/Kwanza/Hanukkah. The 'Hour of Code' is a nationwide initiative by CSEdWeek and code.org to introduce computer programming to 10 million students and encourage them to learn programming. Tynker is proud to be a curriculum provider for the Hour of Code. Today i was on santa i was doing a challenge to get it in the santa present i won level 1 and 2 now am up to level 3 it sos so hard to make it go to the present bag so we use rolling to roll the present and a jumper to make us jump in present bag.the game was very fun to play and little hard but it saw fun. Today i was on santa tracker i was dancing my moves was point right,point right, step right,splits,hip shake,point lelt,splits,hip shake,hip,shake,splits it was cool it look like i was a great dancing ever and i can make good moves i was fun and funny also funny moves to use.I did another santa tracker to create santa.This is my another dance on dance tracker. Today i was on santa tracker i was learning to put in pieces in the right places so i was making alf i had to put in three pieces in each part and it said i done great and it was like coding. we were doing santa track here is some photos of what we did is was dancing on santa track and I was doing santa.The movements I did when I was dancing was turn right point left point left again then turn left do the splits point right do hip shake hip shake again the the splits after I finished dancing is was creating santa the colors I used on santa was blue and red. 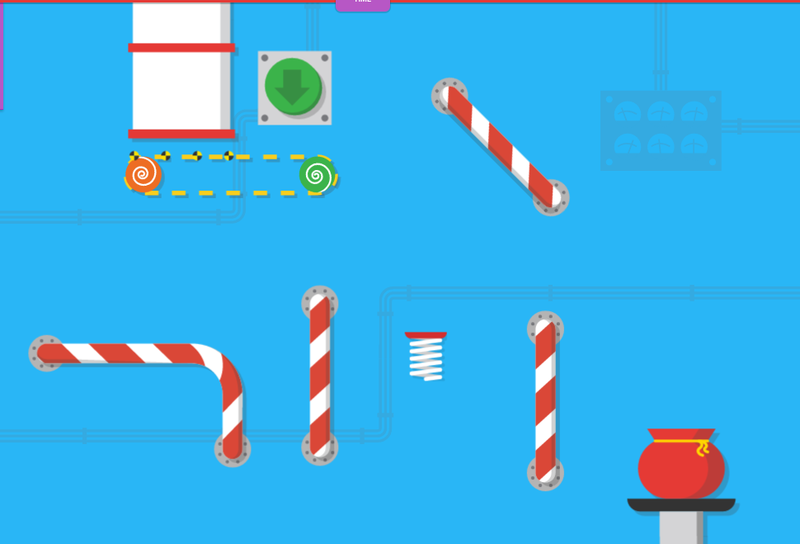 We were doing santa track well some off the class we were doing santa track because it is fun and it is cool it is just like coding.And this is santa track. Find 5 words you found in the blogpost that were new to you. Record these, and find the meaning. An example has been done for you. You can add an image if you want to. When something is very busy, lots of people are there, maybe everyone is confused. waste or rough fragments of stone, brick, concrete, especially as the debris from the demolition of buildings. having short, sharp vowel sounds and clear pronunciation. working by itself with little or no direct human control. he action of evacuating a person or a place. Find a phrase that you didn’t know, or helped create a picture in your head. Find out what it means. as if the ground had turned to liquid. This helped me create a picture in my head of the ground turning from solid to liquid. In my head I couldn’t stand up anymore, I was falling over and all the stuff around me fell to the ground as well. Everything was moving. We were writing about the meaning of new words and phrases. This story talks about the Earthquake that hit the South Island of New Zealand recently. Find three key ideas in the story, then write 50 words to summarise. The earthquake caused cliffs to collapse into the sea but no major damage to the city was reported." The epicentre was 15 kms (9 miles) east of Christchurch and at a shallow depth of 15 km (9 miles), said the country’s seismological body Geonet. Start here:A strong 5.7 magnitude earthquake struck Christchurch on Sunday. The earthquake caused cliffs to collapse into the sea but no major damage to the city was reported. Geonet said there were more than 40 aftershocks. The quake came eight days before the anniversary of the deadly 2011 quake that caused upwards of NZ$40 billion of damage and took the lives of almost 200 people. We were writing about the main idea in a story with an earthquake happening in the story. WALT : describe a sound and draw a picture. we were writing about a sound that earthquakes sound like. Watch the clip again and carefully watch what the people are doing. Why do some run away? Why do some stand still? When the bridge collapses, what do the people do? Why do they try to get into the van? Use these questions to help you think about the way people might have been feeling during this earthquake. Write 30 words about how they might be feeling. Imagine you are one of these people who have been in a terrible earthquake. Think about how the day that the earthquake hit. What were you doing before it hit? When the earthquake hit, how did you feel? Scared, confused, alarmed? What did you do? Run, scream, get scared and stay still, cry? What did you do next? Try to find friends/family? Hide in a doorway or under a table? Run away? How were you feeling throughout the day? What happened at night - where did you sleep? Was your house okay? Was your family okay? Write a 100 word (or more) diary entry about your imaginary day. Start here:The Earth trembles underneath me, The walls start to shake, Rumble...Rumble...Rumble.. It's an earthquake. Hide underneath the table, Try to remain stable, The walls have turned upside down,it's an earthquake. I start to tremble, Is everybody safe?I call out to silence, It's an earthquake.I find shelter and everybody's safe We hug and embrace,It's an earthquake. He plunders my belly, and pierces my skin. But adorns me with riches, that He finds from within. A gift of thorny crowns A demonstration of His claim.But if my bones resist- you die.